Keeping track of your teenager's social media activities don't reflect your overconcern but a responsibility to protect them from modern-day threats like Cyber Bullying, Online Theft, etc. You can't simply take away their MacBook and smartphones every day just to check what they're up to. I personally believe that's just popping into someone's privacy. Fortunately, Elite Keylogger for Mac is perfect for the job. It offers excellent tracking features and tools to keep tabs on the internet and laptop use in your home. Elite Keylogger is a PC monitoring software that provides a simple, easy-to-use user interface. It is available for both Windows and Mac powered devices. The installation only takes a minute and prompts the user can install the software in visible or invisible mode. The visible mode displays a desktop shortcut and login alerts during the monitoring activities. Moreover, the hidden mode hides the Elite Keylogger in the background, so the users are not aware of being monitored by the software. In this mode, the application performs its functions in complete stealth. Initially, the software is a premium one with all the exclusive feature, but the free trial doesn't lack to satisfy. With features like Website tracking, clipboard capturing, and key store logging available in the free version, you couldn't ask for much. You will quickly notice that the software popups two warning screens. First one indicates that this Keylogger is invisible, but the software such as antiviruses can detect Elite Keylogger. Therefore, I'd recommend closing all the software when you install the Keylogger software. Now, the tool allows configuring the Elite Keylogger that it would remain stealth after the reboot. Elite Keylogger is best known for recording keyboard strokes and details which you can later view in the reports section. You can install the software to run either transparently or in stealth mode as well. The stealth mode usually hides the software which means that users won’t even recognise about the monitoring of Elite Keylogger. The software takes screenshots and captures both sides of the instant messaging conversation for more details. The owner may view reports by physically using the monitored PC device as the application has an easy-to-navigate UI. By default, the reports include Screenshots, Keystroke Reports Applications History, Internet Activity, E-mail, Clipboard, and Passwords & printed documents. Not only this, you can find the detailed information once you click any of the mentioned headlines. The second screen explains you about creating a System Restore Point. However, you have the option not to create it by marking the corresponding checkbox, but mostly it is recommended to create one during the installation. Another exciting feature is the “Automatic uninstallation” option. It allows you to fix a date for the automatic removal of Elite Keylogger from your device. However, you cannot get the custom ones. It's either a week later, a month later, and so on. The Interface of Elite Keylogger is exemplary in many ways. You can get the information in grouped sections. The system also separates the whereabouts related to users, and windows opened applications used by the user, and time of the event of the incident. Elite Keylogger offers a minimalist feature set that quickly performs limited monitoring of your kid's internet activity. It records accessed websites, traces content from social media sites and captures both sides of chat conversations as well. Computer Admins can also customise the frequency of screenshots taken as well as set up a remote reporting and monitoring frequency options. The monitoring application tracks opened applications, passwords, user names and other sensitive information that can be vital. The user can quickly adjust the frequency and the resolution quality and of the screenshot. You can also choose to track the entire screen or the active Window only. It also detects the system login passwords which is usually desirable for analytical purposes later on. You can see the general features of Keylogger software such as logging of keystrokes and clipboard content. The software can record system logon time, started applications, as well as documents printed. While the system is connected to the internet, Elite Keylogger can log the URLs visited and tracked the incoming and outgoing emails. This is one of the best features in Keylogger Elite. The software generates report files on a daily basis, and you are entitled to send the logs remotely to the Admin by emails, LAN, FTP, as well as Pen drives. Being a pervasive software, Elite Logger is officially available for devices that run on 32-bit OS as well as 64-bit Windows 7, Vista, and XP as well. Elite Logger for Mac has expanded support up to Mac OS 10.12 Sierra. The software is password protected and cannot be just uninstalled or terminated by any other user. 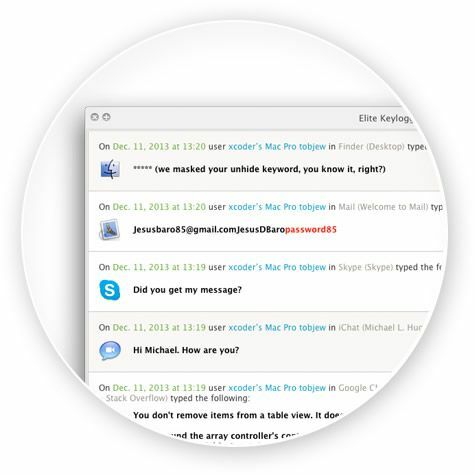 To be frank, Elite Keylogger offers affordable plans for its Pro version regarding licenses. 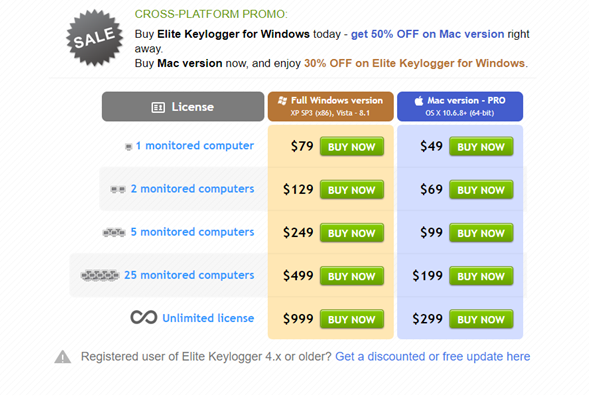 The Elite Keylogger for Mac is priced $49 for a single monitored license whereas $79 for the Windows Variant. The pricing varies with the increase in a number of monitored computers. You can get more information about the pricing and new discounts on the official Elite Keylogger website. Not entitled to block or restrict applications and websites. Does not creates a list of keywords. It works flexibly with Schedules. Exclusively available in English, Spanish, as well as Russian. Lacks sufficient and quality blocking and filtering controls. 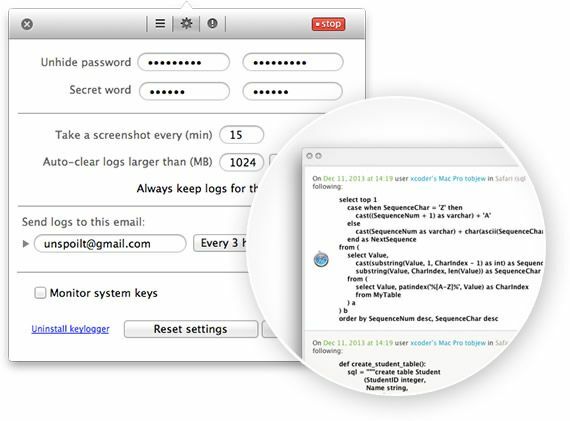 Elite Keylogger for Mac is an excellent monitoring software for people who want to track computer and internet use of controlled computers. Though it lacks in blocking and filtering capabilities, the software still is the best among the price range. Do share your thoughts if you wish to use this monitoring tool on your personal computers at home or in the office for any suspicious activity. Be sure to try the free version first as it also offers some good features too. Let me know if you liked this software or not in the comment section below. Cheers!